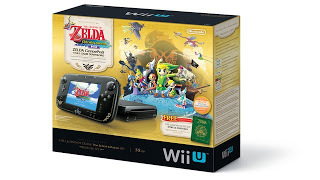 Nintendo Wii U Price Cut and Wind Waker Bundle! Now for some Nintendo news to be excited about. September 20 will usher forth a $50 dollar price cut on the Wii U, as well as the release of the Legend of Zelda: The Wind Waker Wii U bundle. The Wii U itself is black and the gamepad will have some Zelda-esque designs on it. The console has a 32GB hard drive and comes with a digital copy of the Wind Waker game. You also get a digital copy of Hyrule Historia. I feel like I’m losing steam here with all this digital copy crap. The upside to getting a digital copy of the game is you get to play it sooner? If you want a hard copy of the game you have to wait for October 4th. The whole digital copy of a Zelda game sounds like a bummer, because that’s the one game series people really love to collect. However, this whole Zelda bundle is $299.99. The regular Wii U bundle that comes with NintendoLand is the same price. So, you’re basically getting a Wii U with a free $50 game. I’m super cheap and I’m also trying to cut down on my game collection to focus more on toy collection, so this is a pretty good deal to me. I currently do not own a Wii U and really haven’t been that excited about them until now. You can order the Wind Waker bundle at Gamestop now and they’re also selling a Ganondorf figurine for $59.99. As much as I hate to recommend pre-ordering from Gamestop to people, it would probably be worth it, seeing as how these bundles are limited edition. This article was originally posted on my other blog, http://r2d2cupcake.blogspot.com, on August 29, 2013. Previous Previous post: Ben Affleck Is Batman? Next Next post: Does Anyone Really Need a Nintendo 2DS? Probably not!